are set to public and you can see many more photos there! Welcome!! We are a small miniature horse farm breeding quality miniature horses with pinto being our passion!! Our goal is to breed horses with correct conformation, gentle temperament and a splash of color!! Silver Ridge is just off highway #50 and only few miles from the shores of Lake Manitoba. Our journey with miniatures began in the fall of 2008 when our middle daughter Abby, BEGGED for a mini horse for Christmas. So began the search for a mini!! We did find a little weanling colt, and ended up buying a mare too. Little did I know how quickly our herd would expand! I was warned that "you can never have just one.". It wasn't long before we began showing, then decided to breed so we can show our own. We do have a passion for the painted horses big and small. 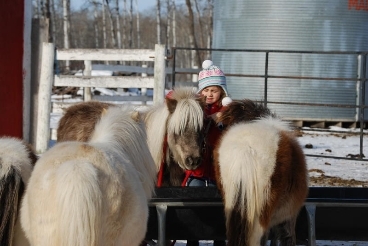 We have always had horses here, used mainly for ranch work and pleasure riding, but I have to admit the minis have truly stolen our hearts, as I'm sure they will yours! Four year old Josie - Haltering her horse to go for a walk! All photos are property of Bluff Creek Miniatures/Karen Brown and may NOT be used or reproduced without prior consent.